First of all, the floor is relatively new yet has some tremendous aging issues due to what I believe was a very poor insulation. Based on the information available, it appears the contractor installed the VCT (vinyl composite tile) on a damp/wet concrete floor that should have been allowed to completely dry first. There may be some issues with the water barrier since it appears that the floor is “weeping” which indicates moisture coming up from beneath. We noted that the building is at the bottom of a hill and when it rains heavily, the floor weeps within a few days. Another concern is that there are raised swirl marks on the floor which is indicative of a poor installation. The contractor apparently troweled out the mastic (think glue), set the VCT and failed to roll it to flatten out the glue. Once it hardened, it was only a matter of time before foot traffic and rolling stock would cause the floor to show the swirl marks. I must stress that this is NOT a sign of poor buffing. Another mistake the installer made was that they scrubbed the floor too soon which allowed moisture to seep in the tiles making the water based mastic fluid. 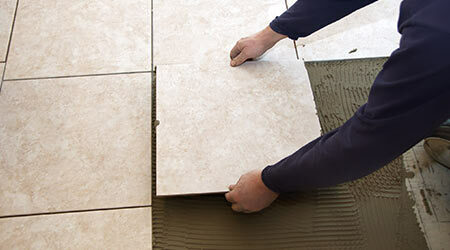 This may be why you are experiencing the seepage between the tiles. You might consider using a razor blade to scrape most of it off before scrubbing with the appropriate pad or brush. I suggest you NOT apply a lot of finish/seal until you are sure the seepage has stopped. Perhaps one or two light coats first and give it time to seep back out or indicate the seepage is over.